Start a Christmas tradition that gives back to others. Get your family involved with the top seven charities that help children at Christmas time so your kids can help other kids. 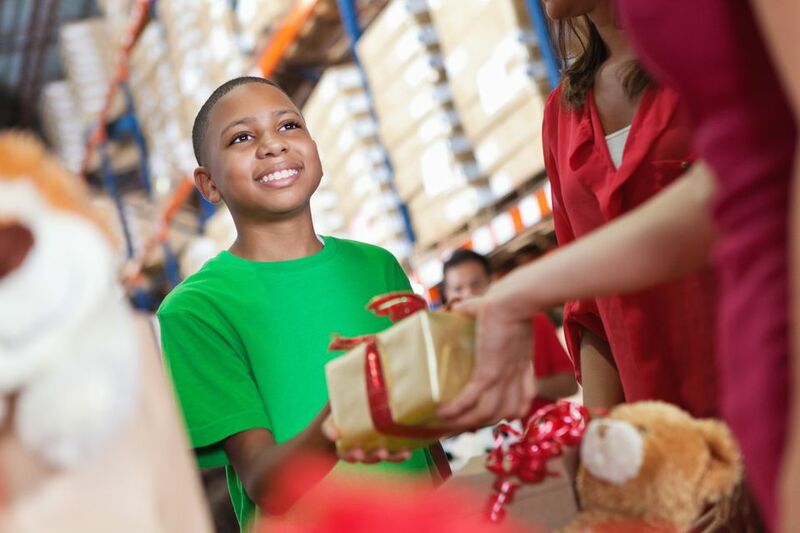 Take your family to shop for a less fortunate child, and you'll teach your kids invaluable lessons on thankfulness, empathy and charitable giving. Purchase a new toy and take it (unwrapped) to a Toys for Tots drop-off location between October and December. Pack a standard-sized shoe box, pick the child's age group your gifts are appropriate for and fill the box with toys, school supplies, hygiene items, apparel, candy and a personal note. Operation Christmas Child also asks that you pray for the child who will receive your shoe box. A small donation is required to cover shipping costs. If you donate online, you'll receive a special label for your shoe box so you can see your box's journey to its final destination. For example, drop off a letter to Santa at any Macy's and the store will donate $1 per letter to Make-A-Wish. Shop at the Disney Store, rent a car, buy a car, book your air travel or have your kids make a Christmas gift wish list at Toys R Us for money to be donated to Make-A-Wish automatically. Another way to help the foundation is by buying gifts that give back. Your loved one receives a beautiful gift, and a portion of the proceeds go directly back to the Make-A-Wish Foundation to help other children's dreams come true. My Two Front Teeth and the Family Giving Tree charities joined forces to help more children. To help a child, visit either website to see the children's names, ages, their gift wishes and how much it will cost to give the child that particular present. Angel Tree helps children who have at least one parent in prison. According to the website, one in three prisoners is a parent, and 75% of female prisoners are mothers. Angel Tree's goal is to bring Christmas and the gospel to their children. Many cities have Angel Tree locations where you can pick a child to sponsor, or you can visit the Angel Tree website to make your monetary donation online. Shoppers receive a list of suggested gifts they can purchase in the store and donate on the spot to "Fill the Truck." The Salvation Army will then distribute the gifts to families in your community. Show your support for your country's service men and women and their families. The Christmas Spirit Foundation provides hundreds of Christmas trees each year to troops stationed overseas who won't be home for Christmas and also delivers trees to military bases for members of the military and their families to receive a free Christmas tree. Monetary donations help give these Christmas trees to those who make so many sacrifices for our freedom.